PRODUCT: EC-100 Acrylic Elastomeric Roof Coating, WHITE, 63% Solids. Cool-Roof and Energy Star Raed. Made in USA by Pro-Tech. 5-Gallon Pail. Price/Pail. 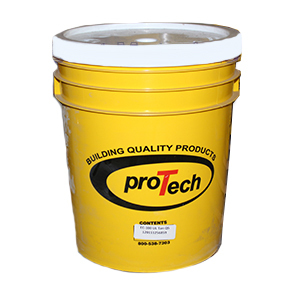 DESCRIPTION: EC-100 is a durable 100% acrylic elastomeric coating with 200% elongation. EC-100 is designed specifically for use over EPDM, new polyurethane foam roofing systems and for conventional roofs requiring superior adhesion and solar reflectance. ICC Evaluation Report ER-5979. UL 790, UL 1256, UL 580, UL 2218 rated. PREPARATION: See Product Data Sheet. Power mix well before using. APPLICATION: Apply only when not subjected to rain, high humidity or dew before curing. Acrylic base coatings must cure before being subjected to freezing (50 degrees F.) or moisture. Example of ideal conditions 4-6 hours above 70 degrees f. and low humidity. COVERAGE: Roll or spray evenly at a rate of 1 gallon per 100 Sq. Ft. This will achieve a mil thickness of approx. 9 MILS per layer. Total mil thickness is dependent on application (25 mils is typical application).